VMWare provides the most comprehensive solution for server virtualization today. 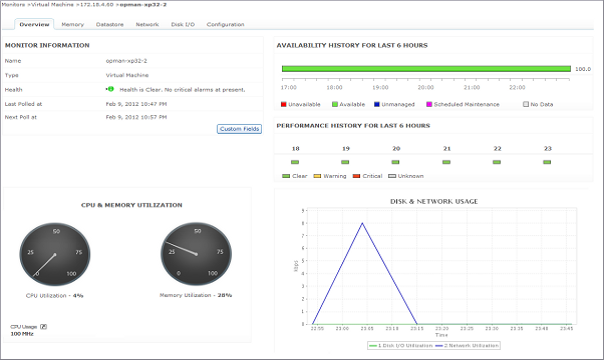 ManageEngine Applications Manager provides comprehensive performance metrics to monitor your VMware ESX/ESXi servers and their guest virtual machines, and helps you ensure they are performing well at all times. Applications Manager connects with VMware ESX/ESXi servers through APIs and determines the health status as well as the performance of host servers and their corresponding virtual machines. With out-of-the-box reports, graphical views, alarms, thresholds and comprehensive fault management capabilities, administrators can maximize ESX server uptime and ensure that the guest virtual machines of the ESX/ESXi servers are running at peak performance. 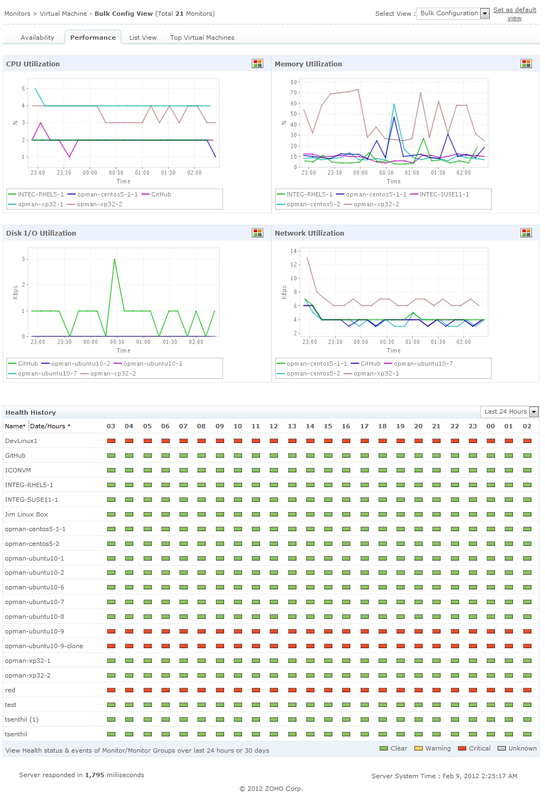 Monitor the current availability and health status of the virtual machines. Troubleshoot problems through the Root Cause Analysis (RCA) window. Know what portion of the ESX Server's CPU is used by each virtual machine and which virtual machine is consuming more CPU. Avoid the problem of your virtual machines running out of memory. Get notified when the memory usage is high or memory becomes dangerously low. 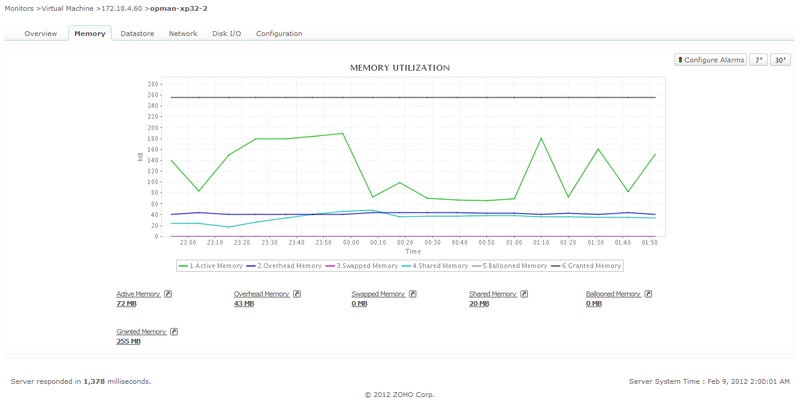 Metrics shown include consumed memory, active memory, overhead memory, shared memory, granted memory, reserved memory, etc. Get an overview of the virtual machines that are consuming your resources and take necessary action. Metrics provided include Top CPU consumers, Top Memory Consumers, Top Disk I/O consumers, Top Network consumers and the health history of each virtual machine.. Ensure high uptime and peak performance of the virtual machines of VMware ESX/ESXi servers. Plan capacity and make educated decisions about allocating virtual machines to host servers. Manage both physical and virtual components of your IT infrastructure using a single console. The VMware monitor is available as an add-on to Applications Manager and is priced $995/year for up to 25 servers or applications.